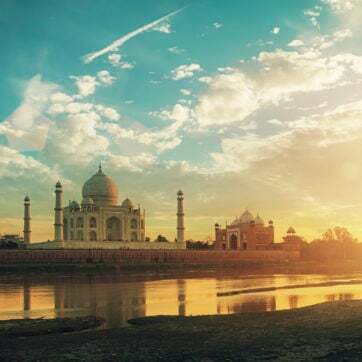 Jacada Travel creates bespoke luxury trips to the Indian Subcontinent. Our team of Travel Designers will create the perfect itinerary for an epic trip through India, Nepal, Bhutan, Sri Lanka or the Maldives. India is a vast country and a real melting pot of cultures. The northern state of Rajasthan is littered with majestic palaces and imposing forts. It is also home to some of the country’s most vibrant cities as well as remote luxury properties nestled in the mountains or between the dusty dunes of the Thar Desert. Head south to Kerala and discover another side to this fascinating country, one of peaceful backwaters, tea plantations and quaint colonial cities. In between all of this are thriving metropolises, spiritual retreats, the beautiful Himalayas and national parks filled with tigers and leopards. With such a vast and varied landscape and culture, India has something for everyone and promises an absolutely unforgettable trip. Sri Lanka distills much of India’s diversity into an island of more manageable size, with fine beaches, ancient temples, rolling tea plantations and national parks home to leopards and elephant. Then there’s Bhutan, ‘Land of the Dragons’. Explore its intricate dzongs, glacial peaks, hilltop villages and vibrant culture in this country which pioneered the concept of Gross National Happiness. Everywhere you go you will be rewarded with stunning views and the chance to involve yourself in a culture that is fiercely protected. For those looking for the ultimate island getaway, the Maldives are hard to beat with crystal clear waters, powder soft white sand, incredible marine life and luxury hotels and villas.